While others go big, Aurora Expeditions' new ship delivers on its "small is best" philosophy, with new technology to make open-sea journeys more pleasant. While many in the cruise industry are going bigger with larger ships and more on-board activities, Aurora Expeditions has remained steadfast on small groups and multiple day landings. The polar adventure cruising company has committed to this ethos with the announcement of a new purpose-built expedition vessel that stays true to the small-ship philosophy. The yet-to-be-named ice-class 1A small ship will be built to the latest polar code specifications. 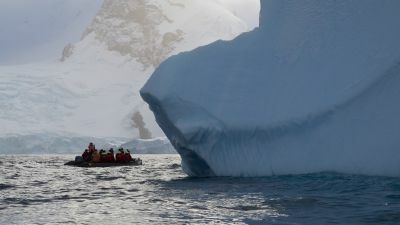 “In the polar regions, we will have the ability to reduce passenger numbers so we can continue to visit existing landings sites as well as explore new areas where strict regulations enforce no more than 100 people ashore at any one time,” Aurora Expeditions managing director Robert Halfpenny said. The 104m vessel will be the first to use X-BOW technology, which has the ability to pierce waves with much greater stability, making open sea journeys – such as the notorious Drake Passage crossing to Antarctica – more pleasant for passengers. While a traditional-bow vessel rises on the waves and then drops onto the surface of the water, an X-BOW vessel is less subject to the vertical motions induced by the waves, Mr Halfpenny said. The ship will feature a custom-designed platform to cater for additional numbers of kayakers and divers, and a mud room for easier preparation for climbers and skiers. The ship also features private bathroom facilities, cabin balconies, a 180-degree indoor observation deck, wellness facilities including gymnasium, sauna and spa, and plenty of outdoor viewing areas. The ship will be delivered in time for the 2019/2020 Antarctic season (November to March) with itineraries expected to be released later this year.